Who says the Christmas season is filled with crass commercialism? Certainly not the inhabitants of the tiny hamlets listed below. Their names might suggest a holiday cheer that could be manipulated in order to stuff local coffers. (We're looking at you Santa Claus, Indiana.) But instead, the opposite is true. Their association with Christmas is almost pure happenstance, with barely any relation whatsoever to reindeer, Charles Dickens, St. Nicholas or any other piece of seasonal folklore. So spread your holiday cheer elsewhere. Humbug, Arizona. There isn't a single visage of Ebenezer Scrooge to be found. For starters, it's a ghost town so there aren't faces of any kind around—except maybe Jacob Marley's. But more importantly, the reason it's a ghost town is also the reason for its name—an early gold discovery ended up becoming a major disappointment. In short, Humbug has about as much holiday cheer as mining success. Jolly, Missouri. The jovial times here derive from whiskey—not Old St. Nick. The town, in fact, specialized in distilling whiskey throughout the mid-1800s. Originally, it was named Jollification, but our guess is that proved to be too much of a mouthful for whiskey-drenched tongues. Snowflake, Arizona. Contrary to popular opinion, it does snow in parts of Arizona. But a preponderance of frozen precipitation isn't what inspired the name Snowflake. Instead, it was a way to honor two of the men who played significant roles in bringing the Mormon settlement into existence—Erastus Snow and William J. Flake. Clever. Dasher, Georgia. Like with Snowflake, the forefathers of Dasher were—surprise, surprise—people, not reindeer. And so, the town—surprise, surprise—bears their name, not the name of a mythical woodland creature that can fly. The truth can be so much less fun. Eggnog, Utah. This one depends on which legend you believe. The first says that the Western outpost got its name because of a sulfurous rotten egg smell wafting from a nearby spring. Which, of course, has little to do with the drink that defines the holiday. The other, however, directly relates to the dairy-based elixir—i.e., the vaqueros of Eggnog (the town) fortified themselves against the harsh winter elements by downing as much eggnog (the beverage) as they could. Which, of course, has a little to do with Christmas. Christmas, Florida. Ok, this one is tiny bit of a stretch—the town has some yuletide associations. On December 25, 1837, the U.S. Army began building a fort, so they named it, and the town around it, in honor of Christmas. Also, each year, the fort hosts the "Cracker Christmas" festival. But with demonstrations of basket weaving, woodcarving and rope making, it's as much a celebration of pioneer life as it is of the holiday. And the town sees itself as so much more than just a place named after Christmas. 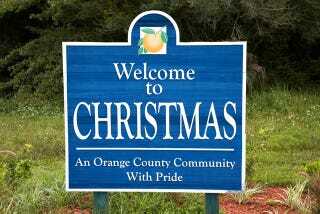 After all, the street signs are adorned not with tinsel, but with oranges. Even more importantly, it's home to the largest alligator-shaped building on Earth. That doesn't mean the outside world perceives it the same way, however. Every year during the holidays, people from all over Florida drive here in order to obtain the city's coveted postmark on their Christmas cards.